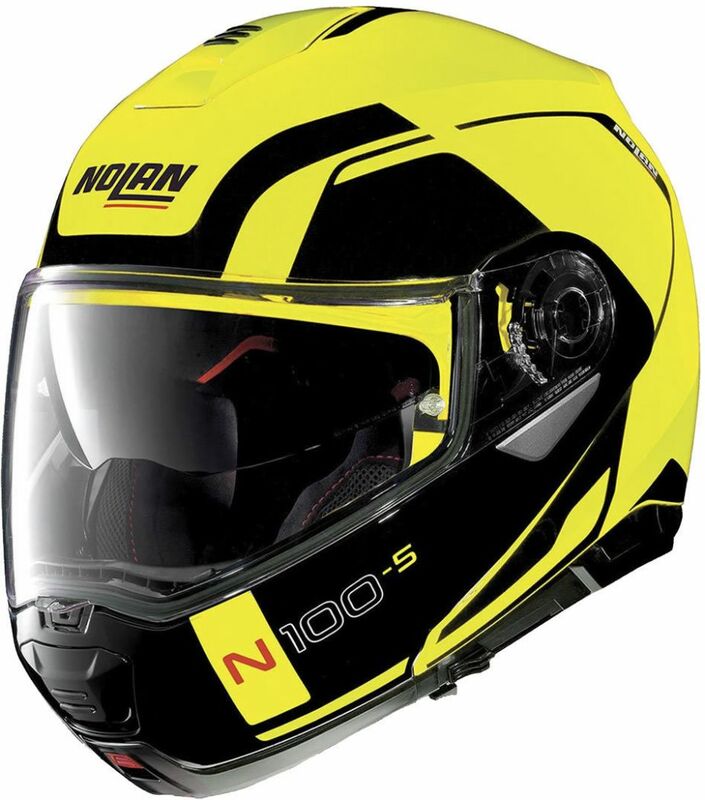 The N100-5 is Nolan’s new top-of-the-range flip-up helmet and is characterised by its elegant design, its many technical features and the wide range of colours and graphics available. It is compact in size (thanks to the availability of two outer shell sizes) and has double P/J homologation for safety, an ultrawide clear outer visor and VPS sun screen (adjustable in various positions and fitted with the automatic retraction system). The Nolan N100-5 has 'AirBooster Technology' through it's upper ventilation system for maximum airflow and cooling. The chin guard has an exclusive double-action opening mechanism and has a rotation in an elliptical motion when lifting. The N100-5 is secured on your head using a Microlock2 double-lever retention system which has micrometric adjustment and the interior has an innovative Clima Comfort inner comfort padding (with micro-perforated fabrics). Being set-up to take the Nolan N-Com communication System (available separately) make the N100-5 one of the reference-point flip-up helmets for the most demanding of motorbike tourists. The large surface of the S/R (Scratch Resistant) visor makes it possible to have a broader view, also lateral, thus highly increasing active safety. The exclusive “AirBooster Technology” upper system ensures optimal ventilation where the rider’s head most requires: the air is extracted from the upper air intake and forced into the most critical areas, avoiding any dispersion, to guarantee maximum comfort also in extreme riding conditions. Moreover, the ventilation system features:- a chin guard air intake this allows ventilation at mouth level and directs air straight to the visor, limiting fogging; - rear extractors they allow for the expulsion of hot, stale air. The chin guard rotation movement with elliptical trajectory makes it possible to keep the total size of the helmet’s front section to a minimum, when the chin guard is open. The “seal” effect is consequently highly reduced and riding comfort is still guaranteed, even when the chin guard is lifted.